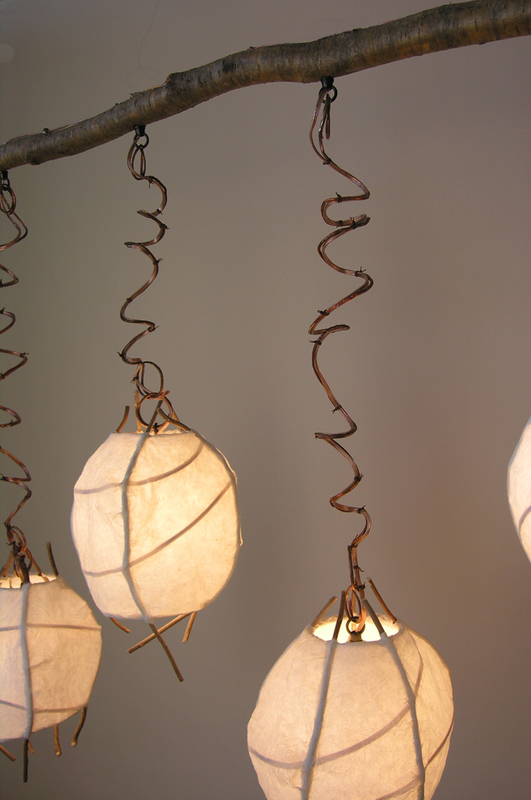 Birch & Willow offers custom lighting design services. We work with our clients to design and create the ideal fixtures to suit their lighting needs. Birch & Willow sconces and pendants are made to order. 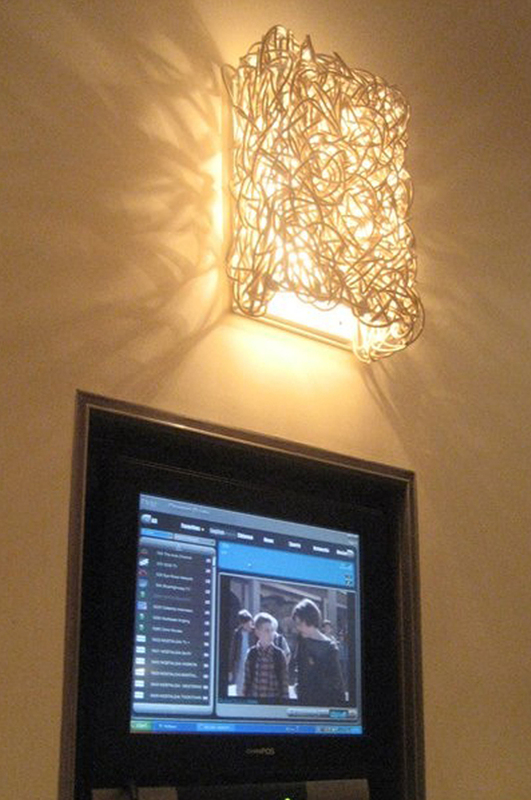 We work with our clients to design and create the ideal fixtures to suit their lighting needs. We consider a number of variables when designing a custom lamp, including placement, function, focal points of the area, other light sources, and the atmosphere to be created. Site visits can be arranged. The slide show to the right includes a range of custom designed range of fixtures, screens and wall hangings. Swipe cursor over the bottom of images to display the text. Contact Kathy Ahern for a consultation: 617-423-3437. Below are two examples of custom designs starting with concept drawings and elements of existing Birch & Willow fixtures. Four custom pendants (48" h x 24" w) were created as design elelments as well as lighting fixtures for a high and narrow restaurant space. Scrims were created for the bottom of the pendants. Five screens were designed and created as a visual barrier between the reception and dining areas. The 7 foot tall screens were installed in a light box. Photo courtesy of Treehouse Design. Pendants were designed to create the feel of vine arbors for a Japanese beer garden. 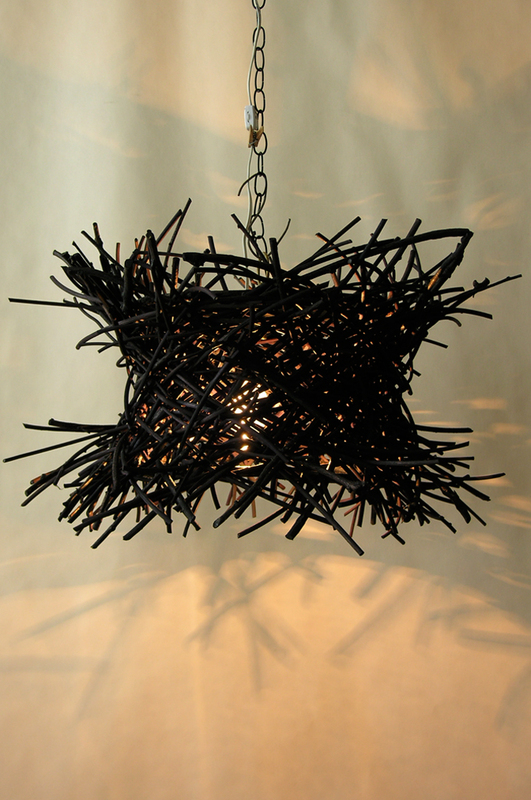 A chandelier concept was based on our Pod Pendant design. Created to hang in a stairwell of a private residence. Our Luminary Sconce design was modified by hand-dying the weaving materials white to match restaurant design. Photo courtesy of Treehouse Design. Created as a visual connector along a corridor between the reception area, yoga studios and treatrooms. Created as visual barrier to hide equipment in a lower level restaurant bar. Weaving materials were hand-dyed red to match a set of chairs in a private residence. Our Roost Pendant design was modified to flare at the top and bottom. Weaving materials were hand-dyed black. Created for a private residence. The 8 ft h x 2.5 ft w pendant was desiged and created for installation in a stairwell connecting the two level spa and yoga center. A sliding metal framework was designed and custom-fabricated to allow easy replacement of the light bulbs. In the first example, we were asked to create a Roost Pendant to be suspended at the top of a 36' tower/residential entryway. The new home was located in a wooded area populated by eagles. We modified the Roost Pendant dimensions to reflect the proportions of an eagles nest. In the second example, a restaurant renovation called for four 48" high x 24" wide pendants to create the major decorative and lighting elements of the make-over. The architect selected the weaving style of our Meadow Sconce and the coil of the design elements. The design was expanded to include the creation of five decorative screens used to establish a visual seperation between the reception desk and dining area. above: Meadow Sconce to Vine restaurant custom pendants. below: Weaving custom screems for Vine restaurant.